This data set reports the results of the analysis of soil samples for nitrate (NO3) and physical properties that were collected for one year following reduced impact logging in logging concessions at the Fazenda Rohsamar in the municipality of Juruena in northwestern Mato Grosso. Sample locations were randomly selected from stratified regions of the 1,400 ha Block 5 to account for local scale soil variability. Soil samples were collected to 8-m depth in (1) nine gaps formed by single tree removal and (2) nine areas of undisturbed primary forest. Areas of undisturbed forest were confined to patches of forest within Block 5 that were protected from logging. An additional 3 forested areas were sampled to 3-m depth that contained high sand content. These results quantified the effects of reduced impact logging, to test whether nitrogen (N) loss from leaves and coarse woody debris under reduced impact logging results in a significant accumulation of subsoil nitrate (Feldpausch et al., 2009). One comma separated data file contains the soil moisture results and a second file the soil NO3 content and soil physical properties. The investigators were Feldpausch, Ted R.; Riha, Susan J.; Passos, Carlos Alberto M.; Lehmann, Johannes; Couto, Eduardo Guimaraes ; Pauletto, Daniela; Rodrigues, Luiz Carlos and Johnson, Mark. You may contact Feldpausch, Ted R. (t.r.feldpausch@leeds.ac.uk ) and Luiz Carlos Rodrigues (mattosr@cpd.ufmt.br). 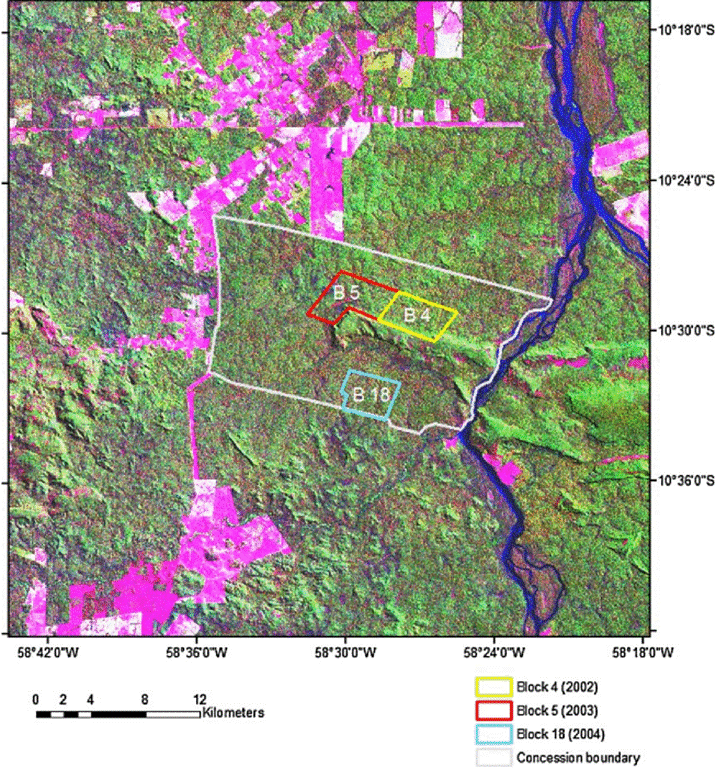 This data set reports the results of the analysis of soil samples for NO3 and physical properties that were collected for one year following reduced impact logging in logging concessions at the Fazenda Rohsamar in the municipality of Juruena in northwestern Mato Grosso. These results quantified the effects of reduced impact logging, to test whether N loss from leaves and coarse woody debris under reduced impact logging results in a significant accumulation of subsoil nitrate (Feldpausch et al., 2009). One comma separated data file contains the soil moisture results and a second file the soil NO3 content and soil physical properties. Data are final and no further modifications are anticipated. All data were collected in the municipality of Juruena in the state of Mato Grosso. Samples were collected between Aug 2004 and August 2005. Two comma-delimited ASCII files are provided. This file provides measurements of soil moisture in gaps and undisturbed primary forest in Mato Grosso, Brazil. 10 Soil _moisture % Determined by drying soil samples for 48 hours at 105 degrees C.
Missing data are indicated with -9999. All sampling took place in Logging Block 5. This file provides measurements of soil nitrate, soil texture and bulk density in gaps and undisturbed primary forest in Mato Grosso, Brazil. 8 NO3_soil mg/kg NO3 concentration in soil. Soil NO3 was calculated by converting solution content to adjusted volume based on soil water content and soil bulk density. The data set covers the period 2004/08/03 to 2005/08/18. Temporal Resolution: Samples for soil NO3 and soil physical properties were collected in August and October, 2004. Soil moisture samples were collected 10 times from August 2004 to August 2005. These data can be applied to model the effects of reduced impact logging on nitrogen cycling with potential implications for forest recovery and carbon sequestration in undisturbed and logged forests. At this time there are no known problems with the data. Soil samples for NO3 analysis and soil physical properties were taken one year following reduced impact logging using a stratified random soil sampling scheme (sample locations were randomly selected from stratified regions of the block to account for local scale soil variability). From these randomly selected areas we collected soil samples to 8-m depth in 9 gaps formed by single tree removal and 9 areas of undisturbed primary forest. An additional 3 forested areas were sampled to 3-m depth that contained high sand content. Soil samples were collected from below the prone crown of the logged tree within each gap or within undisturbed forest using an Edelman auger extendable to 8-m at the following depth increments: 0-20, 20-40, 40-60, 60-100, and 50 cm increments thereafter. Soil samples were stored in bags in a cooler with ice in the field and stored at 2 degrees C at the end of the day (Feldpausch et al., 2009). Soil mineral N was extracted the following day with 1N Potassium Chloride (KCL). The soil and KCl solution was shaken for 5 minutes and then stored at 2 degrees C for 16 hours to allow the soil to settle. Subsequently, 60 ml of the supernatant was transferred to new vials and stored at 2 degrees C until analyzed. The samples were filtered and analyzed by cadmium reduction. Nitrate (NO3) was measured on a spectrophotometer (GENESYS 5) at the Universidade Federal de Mato Grosso, Cuiaba. Soil nitrate was calculated by converting solution content to adjusted volume based on soil water content and soil bulk density measured to 8-m depth. Soil physical properties were measured in the intact 8-m deep forest samples. The soil was air dried, screened through a 2 mm stainless-steel sieve and analyzed according to methods described by EMBRAPA (Silva, 1999). Soil bulk density was measured at the depth increments given above to 8-m depth by collecting a known soil sample volume using an Edelman auger. Soil moisture samples were collected 10 times from August 2004 to August 2005. To determine soil water content, 40-50 g of soil was taken from the sample, weighed wet, dried for 48 hours at 105 degrees C to constant weight and re-weighed. Silva.F.C. d. 1999. A manual of chemical analyses for soils, plants and fertilizers. EMBRAPA Technology Transfer Communication, Brasilia DF.